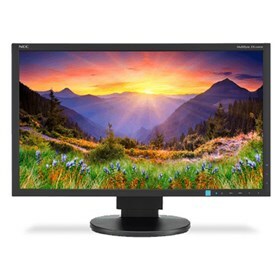 The NEC EA234WMI-BK is a 23" LED-backlit desktop monitor which ideal for corporate environments and is designed to enhance work performance. This LCD monitor has 1920 x 1080 resolution and features IPS Panel Technology with wide viewing angles and ergonomic adjustability. The ControlSync™ Technology allows users to control up to six displays in a multi-monitor configuration, whereas the LED backlight provides low power consumption and less hazardous materials. The EA234WMI-BK features Smart sensing technology that automatically detects your work conditions to determine the proper display brightness with ambient light and human sensors. With integrated USB 2.0 hub, you can easily connect to your peripherals. This monitor features 178° horizontal and vertical viewing angle and brightness of 250cd/m2. The NEC EA234WMI-BK has many exciting features for users of all types. You can extend the lifetime of your NEC EA234WMI-BK with the purchase of a FactoryOutletStore Factory Protection Plan. See the NEC EA234WMI-BK gallery images above for more product views. The NEC EA234WMI-BK is sold as a Brand New Unopened Item.